ESM provides value added services to Agencies and their clients with the goal of retaining existing accounts and creating a competitive advantage to obtain new opportunities. Our vision is to support your Agency needs in providing your insureds with education and resources focused on reducing the risk and cost associated with Workers’ Compensation. Whether your needs encompass Claims Management technical expertise, Cal-OSHA Regulatory Compliance or Return To Work programs that reduce Temporary Disability costs, ESM's core services model align with your Agency needs and your insured's pain points. 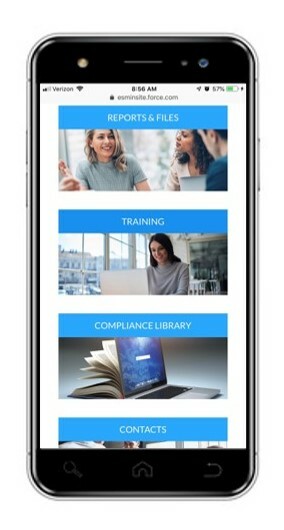 An Agency digital briefcase providing clients with secure communications, compliance library, premium training content….and a competitive advantage. Our vision is to support Agency needs in providing their insureds with education and resources focused on reducing the risk and cost associated with Workers’ Compensation. Our service team works with our Agency partners to create a service plan and budget that reflects the client's needs. The plan is then executed with the goal of obtaining optimal results. By integrating appropriate strategies, ESM & your Agency play a critical role in mitigating Workers’ Compensation risk and cost. This results in a satisfied and long-term client. Contact us today, or to get started click below and complete our Referral Form.